The Linenwalas Bamboo Sheet Set is a pretty high maintenance and high quality set of bamboo bed sheets. They currently have a 4.4 star rating on Amazon and a plethora of great reviews. You have to question if they are high maintenance because they are high quality sheets, or if they are just trying to be high quality bamboo bedding. Let's find out. The Linenwalas Bamboo Sheet Set is made from 100 percent rayon from bamboo fabric. Often called bamboo viscose, it makes up the majority of quality bamboo fabric and the best bamboo sheets, on the market today. Most companies make rayon viscose with a specific viscose manufacturing process. This involves dissolving the bamboo cellulose in a strong solvent. This creates a pulpy solution that's forced through a spinneret and into another solvent that solidifies the cellulose strands into the fibers. They then use this product to make the thread for the fabric and ultimately the rayon. Some of the chemicals that companies use in the process of making rayon include chlorine bleach, sodium hydroxide, sulfuric acid, and carbon disulfide. Due to this, the rayon tends to not retain much of the original bamboo and its beneficial properties. In fact, bamboo rayon sheets are required to be labeled as rayon made from bamboo. This is because, in 2009, the FTC (Federal Trade Commission) found that rayon made from bamboo really does not retain any of the antimicrobial properties of the bamboo plant. In addition, it's manufacture is absolutely not eco-friendly as the process results in a lot of wastewater, along with harsh and toxic chemicals. The sizing of these bamboo bed sheets is very nice. Inside the bed set, it includes one fitted sheet of 78 inches by 80 inches, one flat sheet of 108 inches by 102 inches, and two pillow cases of 20 inches by 40 inches each. The fitted sheet also has 16-inch deep pockets. This is fairly standard, but this size should still be able to accommodate your bed, even on a mattress with a topper. The Linenwalas Bamboo Sheet Set does come with a few cool features for you and your bed. While temperature regulating is rather standard when it comes to bamboo bedding and sheets, it is still nice to know these have that. 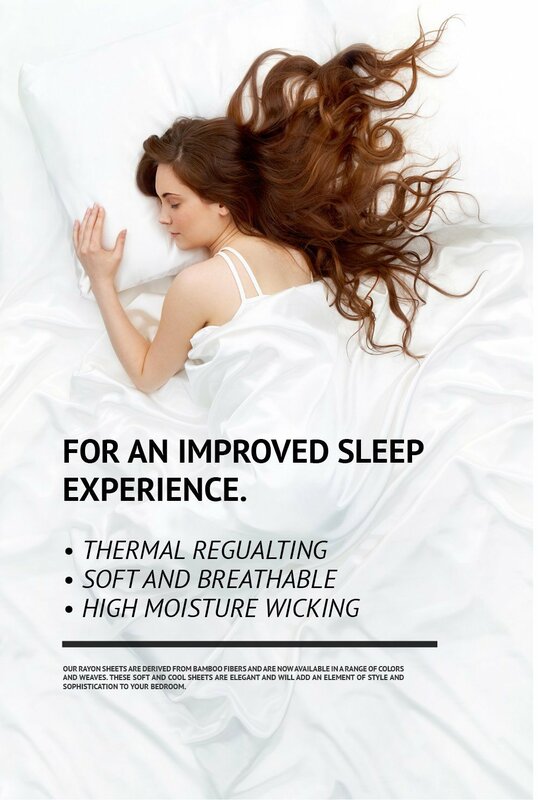 These bed sheets regulate your body temperature by keeping you cool when it is warm and warm when it is cool. This is because they are moisture wicking, meaning they absorb and radiate moisture. These bed sheets also come medically recommended for people with various types of sleep symptoms, including restless leg syndrome, insomnia, allergies to dust and dust mites, asthma, menopause, night sweats, lupus, and more. While the antimicrobial properties of these sheets are probably little to none, given the general consensus around bamboo rayon fabric, the rest of the symptoms are believable. As for the care these luxury bed sheets require, that is where they need a bit more upkeep than standard bamboo rayon sheets. They are machine washable, but only if you use cold water and a mild soap. However, they require to be line/air dried instead of in a dryer. While that may be a deal breaker for some, given not everyone has the availability of a dryer line, it does mean that they are high quality bed sheets. Linenwalas is a premium brand that manufactures and sells exclusive contemporary luxe collections of Tencel, Egyptian, organic cotton, and bamboo bedding. Based on the latest trends in the world of home decor, the high quality luxury and hospitality range of home furnishings are in high demand. This company produces a variety of products, including luxury bed sheets, pillows, protectors and encasements, bed covers, table covers, napkins and more. Companies create these products with the aesthetic fusion of fashion, style, and material. The Linenwalas Bamboo Sheet Set is made from 100 percent rayon from bamboo fabric. This means that it is very soft, even more so with its 300-thread count. In terms of the level of care, these bed sheets require a bit more than is standard. While they are machine washable, it is recommended that you air dry them to avoid damage and pilling. This also means that they are of a higher quality. These sheets do come medically recommended. The various symptoms that these can help with include insomnia, restless leg syndrome, allergies to dust and dust mites, and many more. This is partly to do with the fact that they are moisture wicking, meaning they absorb and radiate moisture to keep the sheets cooler and regulate your body temperature throughout the night. These sheets are not eco-friendly. The number of toxic chemicals the company uses and the fact that the manufacturing process results in a lot of wastewater makes them not entirely friendly to the environment. In addition, the general consensus around rayon from bamboo fabric is that due to the chemical processing they go through, they do not retain any of their microbial properties they once did. This means that they are not really hypoallergenic. The biggest complaint I have seen from these sheets is the fact that the fabric requires a bit more upkeep than regular sheets. One review said that they cannot really be stored away, as they will wrinkle quickly. Additionally, the fabric may become wrinkled just from sleeping on them. As long as you do not really care about wrinkles, these should be great sheets for you. However, they will require you to line dry them, which can get annoying after a while. If you have the ability and the time to give them to proper care, these high quality sheets should make you very happy. Overall, these are pretty great sheets. While there will be some who do not like them, most people seem to love them. If you want to see where you fall, you can grab a king set on Amazon for $89.90. For any other information, including the best bamboo sheets, Cosy House bamboo sheets review, and Zen bamboo sheets review, check out the rest of Green and Growing. Here are some top questions that I found for people seriously considering buying the Linenwalas Luxury Bamboo Sheet Set. Is there any pilling that happens with these sheets? There will not be any pilling if you follow the washing recommendations. Do these wrinkle easily? Unfortunately, yes, they do. Do these hold any certifications? They are made in an Oeko-Tex factory.